plays a part in theatrical production; impersonates and portrays character by speech and gesture; sometimes specifically designated, e.g. cinema actor, actress. a theatrical manager (880) (q.v.) who is himself an actor, usually playing a part in play produced at his theatre; may also be producer (880) (q.v.). a professional singer (886) (q.v.) with dramatic training, qualified to play in opera, etc. ; cf. operatic singer (886). general term for a professional actor, dancer or entertainer; includes comedian, comedienne, elocutionist, entertainer, humorist, reciter, ventriloquist, tragedian, tragedienne; sometimes specifically designated, e.g. comedy artiste, music hall artiste, variety artiste. a member of musical comedy or revue chorus. plays a humorous part in a theatrical or cinematograph production, or sings humorous songs in a music hall, or other entertainment. 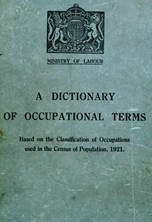 general term for one who performs dances, either alone, with others or in a troupe or ballet, at a theatre, music hall etc. ; often specifically designated according to kind of dance performed, e.g. ballet dancer, eccentric dancer, clog dancer, toe dancer. an actor (q.v.) who performs in dumb show. general berm sometimes used for any person engaged professionally in the theatrical profession. plays minor or "supernumerary" part on stage, i.e. a part which requires only dumb impersonation or "walk-on". learns one or more parts in a theatrical production; attends rehearsals and each performance, and takes part if required by absence of actor or actress understudied; often also plays small part or walk-on.